Nominal Rolls – The 60th Battalion C.E.F. 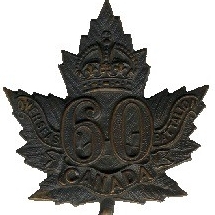 "Victoria Rifles of Canada"
The Nominal Rolls of the Canadian Expeditionary Force are described by Library and Archives Canada as the “lists of soldiers on strength with the unit on a particular date.” They were generally created in the course of a unit’s formation in Canada, often in preparation for departure overseas. Five copies of nominal rolls (army form MFW 20) were to be prepared by the regimental adjutant. Two were submitted to the headquarters of the Military District in which the unit was raised, in the case of the 60th Battalion, this was Military District 4. The Military District sent one of its copies to the Department of Militia and Defense in Ottawa. The remaining three copies accompanied the battalion overseas. The first page was to contain a list of officers, arranged in order of rank. Other ranks followed on succeeding pages, arranged in alphabetical order, showing full name, rank, and regimental number. Follow this link for a copy of the 60th Battalion & 1st Reinforcing Draft These lists show only the names of men recruited by the 60th battalion and who were on the Nominal Roll at the time of departure for overseas. The battalion recruited 1,662 men while only 1,078 names appear on the units Nominal Roll on departure with another 250 names on the 1st Reinforcing draft`s Nominal Roll. 334 men were recruited but were discharged before the battalion sailed. The Part II Daily Orders of the battalion were a prime source in accertaining the names of men who arrived as reinforcements. The Part II Daily Orders numbers 26 through 44 for the period August 22nd to September 21, 1916 are missing and it is possible they contain the names of men who joined the battalion and left the battalion during tht time period. The period in question is during the Battle of Courcelette.